Coffee is one of the favorite drinks for most of us. And what is more exciting, the availability of various advanced gadgets in this technological era to make your favorite shots without any hassle. Espresso Machines are the best way to brew your favorite coffee. The texture and flavor it gives is really unmatched. But what if you want to take your rich and balanced espresso on the go? It is not possible to carry the heavy espresso machines with you. So, there comes a new advanced gadget that makes it easy to get your favorite espresso shots on the go. Guess what? Yes! I am talking about the Portable Espresso Machines. What are Portable Espresso Machines? Perfect brewing gives a better taste and texture to your coffee. And for this, espresso machines are the most ideal choice. With a portable espresso machine, now you never miss out your favorite delicious cup of coffee wherever you are. 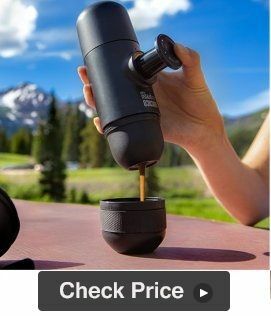 Whether you are on a long drive, or you are out for hiking or camping, the portable espresso machines are your best companion there to get the perfect espresso shots. These are small and compact machines that you can easily carry along with you. Plus no need for mains electric supply. You just need the super hot water to power these portable presses. Get more information on Portable Espresso Makers from our Buying Guide Section. 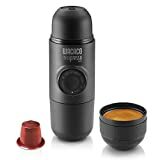 Being compact and portable, yet innovative and powerful, the Nespresso Mini Espresso Portable coffee maker is the best choice to enjoy the perfect espresso shots at home, office and even on the go. Its powerful extraction pump offers you the delicious, rich and bold coffee every time. Its aesthetic design and sleek appearance is the best eye-catching part. The Mini Espresso is compatible with NS capsules where the coffee is ground, measured and tamped with high precision to give you the creamy, rich and tasty coffee. This portable espresso machine comes with an ingenious core and the semi-automatic piston for fully handheld operation. Coffee making is very simple with this device. Just unlock it from the carrying position and press the piston to control the amount of extracted coffee. The best part is that it comes with the water tank of different capacities so that you can enjoy multiple espresso types. It also comes with a cute nano-mini case to protect the device from dust and scratches. You can easily store the device conveniently in it and also carry along with you very easily. Incredibly elegant, beautiful and powerful, this compact and portable espresso maker from Wacacco is surely be a great addition to your regular coffee drinking routine. 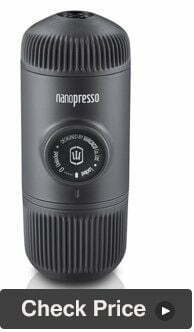 It is one of the best and most versatile espresso machines that let you simply and quickly prepare your favorite espresso shots on the go. The device is designed with a newly patented pumping system that can reach a maximum of 18 bars of stable pressure to give you the coffee of unmatched quality. The rich, creamy and bold flavor it offers is truly appreciable. Operating this portable espresso maker is very simple than ever before. No handheld operation is required as the coffee making fully depends on the machine. You just need ground coffee and hot water, and the nanopresso to get your next shot. The 80 ml water tank capacity produces enough coffee for you in one go. And the water tank is lined and protected by the detachable cup to protect your hands from heat. What is especially best is its ergonomic design and short length that makes it the best travel companion of yours to satisfy your coffee cravings anytime and anywhere. At the same, the cleaning of the device is super simple. Its new portafilter design allows every component to detach easily for the best cleaning experience. The next in our list is this smart and handy portable espresso machine from the brand Tech Trendz. Being compact and sturdy, the device is great for getting high quality and consistent espresso shots every time. It comes with a built-in cup and scoop to make coffee making process very easy. The device supports fully hand-held operation; no electricity is required. 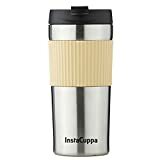 And so it is your ideal travel companion to get your favorite coffee whether on the camping, hiking, at the office, and even at the hotel rooms, and other outdoor trips. And overall, it makes a pretty good espresso in a relatively short period. You just need ground coffee and hot water. And the rest machine can do. 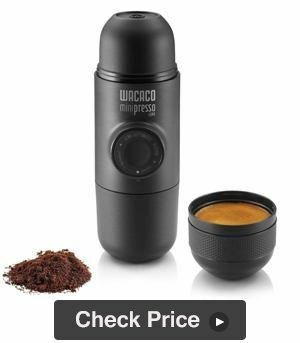 The Minipresso GR Espresso Maker from Wacaco is another wonderful addition to get your favorite espresso shots for outdoor trips. This small, lightweight and versatile handheld espresso machine delivers the great shot every time you use it. And also make sure a convenient and enjoyable coffee making experience. It is designed for a single shot only and does not take much time to brew a single cup. This espresso maker lets you use and select your own variety of beans allowing you to try new flavors. So, you can go out for the experiment with different flavors, mix them and a lot more. This handheld device supports handheld operation and controlled by a semi-automatic piston. It controls the amount of coffee you want to pour into your cup. 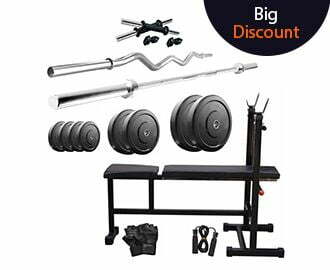 You can also choose for water tank of different capacities to get the most from it. Also, a cute mini case comes with it to easily carry it along with you and to protect the device from scratches and dust. 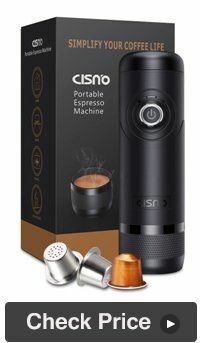 And last but not least, the Cisno Electric Portable Espresso Machine that is your great companion for camping, hiking, and business trips. This portable espresso maker can easily get fit in your backpack because of its small, compact bullet-shaped design. Coffee making is very easy in it with its simple one press button. 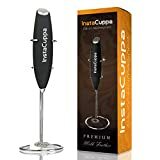 Its 15 bar high-pressure pump allows the barista style coffee by unlocking the delicate flavor and premium aromas of coffee capsules while brewing. The device is compatible with either the genuine Nespresso capsule or SealPod reusable stainless steel capsules. With ground coffee, you can vary the intensity of your espresso. This cordless espresso coffee maker also comes with a 12V car charger to charge the battery pack or to heat and pump the espresso. And so you can enjoy the coffee in your car also. It’s super easy operation and fast coffee making make the device an excellent purchase. Majority of the portable espresso machines are manual. These machines require just hot water and a little elbow grease. Means you must manually pump the machine to make coffee. Plenty of models are also there that operates on rechargeable batteries, some of which are built-in and some are removable. You can charge it via USB cables, and even some of them can be charged via the DC outlet in your car. How to Brew With a Portable Espresso Machine? Here is the video showing you how to make espresso shots using both hot and cold water with the portable espresso machines. Before buying a portable espresso maker, it is very much important to keep in mind the size and dimension of it. If you are frequent on outdoor trips, choose the one that takes little space on your luggage. 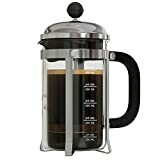 Moreover, a large-sized coffee maker is ideal for making more coffee in one go, but if you are a single user, you can choose the one that is smaller in size. Also, if you want to purchase the coffee maker for your home use, go for the one that ideally fits in your kitchen space. We have already discussed about the manual and battery-powered portable espresso machines. The high-end models require a power source to work and is ideal for home and office use. And on the other hand, the portable espresso makers that don’t need power is ideal buy for the travelers, although it comes at the lower price range, but has some flaws too. If you want better tasting and a hotter cup of coffee then investing in a battery-powered portable espresso machine is a great deal. Brewing time is another most important factor. So always opt for the one that can offer a quicker coffee making process. Check for the brewing time to know how many cups the given model can brew in which period. A good portable espresso machine is the one that is more flexible to offer you a variety of coffee types like Americano, Cappuccino, Latte, etc. Enjoying a cup of espresso really meant but what if the espresso maker is very messy to clean. The whole enjoy gets ruined. So, choose the one that gets clean quickly without any mess. Some models are also dishwasher safe that makes the cleaning process really a breeze. The extra bells and whistles make a product more wonderful. And when it comes to portable espresso machines, it comes with many handy accessories that make the job little more easier. Measuring scoop and something to pour the hot water etc. are some additional accessories included with it. Some come with the built-in mugs that are ideal for camping trips and making coffee at hotel rooms. Some also come with the carrying cases, that are ideal for taking it along with you on the camping trips. Plus, you can also keep all the parts in an organized way in those cases if not in use. 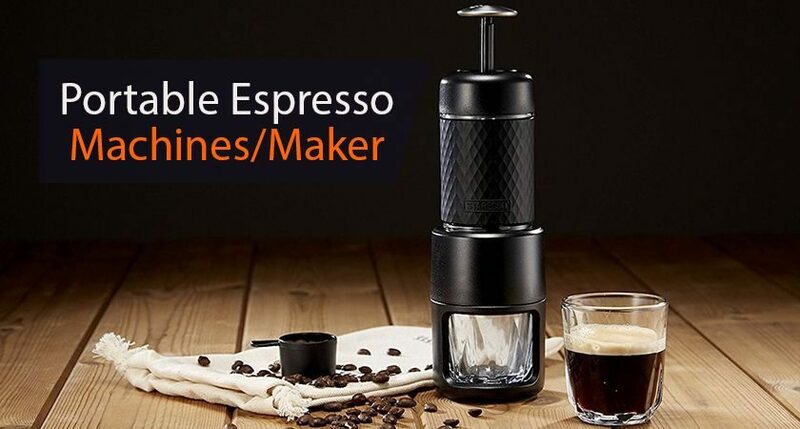 So, finally wrapping it up, I think the above buying guide will surely help you in finding out the best portable espresso machine depending upon your need. 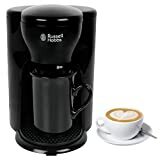 Whether you are on the camping, hiking, or staying in hotels, and even for the home and office use, the mentioned models will offer you rich and great flavored coffee whenever you want.